It's a Birthday Party ~ And You're Invited! We are three years old and it’s time to celebrate! ONBC was born three years ago when our first discussion of Stephen King’s Secret Window, Secret Garden began at two past midnight on November 1, 2003. As is our annual tradition, we will begin our celebration at two past midnight (Pacific Standard Time) this Wednesday. We would like to invite you to drop by the partay! While I have your attention…a few more announcements! Mark your calendars! The Monday Night Thread returns next week, Monday, November 6. Come join us! I hope you all have found your copy of our next read, Happy Days by Laurent Graff. Tidbits begin in mid-November and our discussion will begin on December 4. Thanks, gilly! We're pretty excited about turning 3! Drop by anytime after midnight and join the party! Thank you, DITHOT for your beautiful presentation of all the books you have already discussed. I have been reading the archives and thought I knew most of them but wasn't sure if I had them all. I have set myself a goal of reading everything that Johnny has mentioned and need to make sure I catch up to all of the ones you ladies have finished. I've been busy this month with two versions of Sweeney Todd, A long way down, The Peoples Act of Love, and the Whiskey Robber. I can't wait to discuss the last two. My copies of Shantaram and Happy Days both just arrived from Amazon.com so I'm catching up fast. Since its ONBC's birthday, I though it might be fitting to look into the clubs history by reading some of the old posts graciously provided by DeepInDepp in the History of the Zone thread in the Pit. Here is ONBC's link and many of the threads are still working. Happy Birthday, ONBC!!! You're one of the main reasons I came to the Depp Zone! Great work ladies for a one-of-a-kind forum! I appreciate all that you've done to keep us well-read! 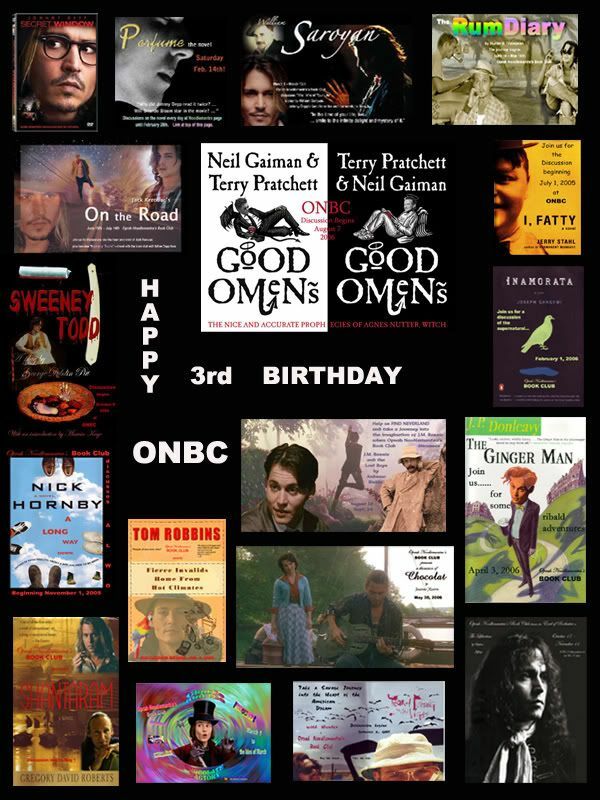 HAPPY BIRTHDAY ONBC!!!!!!!!!! Thanks for all your hard work DITHOT and LIZ! I just noticed in the other post we were supposed to bring some answers to those questions to this party. I need to think on those, but seeing as it is almost 1 a.m., the brain isn't firing on all cylinders at the moment........I will have to get back to you. Last edited by Gypsylee on Wed Nov 01, 2006 4:51 am, edited 1 time in total. A very to ONBC ... wishing you many, many more in the years to come !! Looking forward to the discussions in the weeks to follow !! Thanks everyone! We don't feel a day over 2! Welcome to the partay! In order to keep track of everyone, please post your thoughts on the other birthday thread. We don't want to miss anyone for the drawing of the ONBC Birthday door prize! Happy birthday, ladies! Although I've been unable to find the time to catch up with your reading, I greatly admire the discipline and thoroughness with which you run the ONBC. Excellent research, fantastic format and friendly and intelligent mods. Long may ONBC live! Although I have read many of the books listed here, I seem to never have time to discuss them, but I am reading what I can. Thank you, Anna & johnnybloom! It is indeed a labor of love! DeppInTheHeartOfTexas wrote: [ It is indeed a labor of love! Thanks for your kind birthday wishes, all. Johnnybloom, glad you are catching up on the books. Inamorata and Shantaram are great books. I jumped from Sweeney Todd right into Inamorata...I look forward to Shantaram.. But I am always one step behind and like Jack I am always running between the raindrops in my life..